BEAUTIFUL Hillside home located in the peaceful & established neighborhood of Triple Peak Ranch Estates! This captivating property sits on over 1/2 an acre and boasts almost 6000 sqft. Enjoy panoramic views of Canyon Lake and the Texas Hill Country from almost every room. Notable features include 31' vaulted tongue & groove pine ceilings* built-in custom cabinetry*majestic floor to ceiling rock fireplace*ss appliances/gas cooktop/double ovens*huge master retreat*3 dual element water heaters*4 split-system central heating/AC units*expansive decking w/hand-cut railing*commercial grade retaining wall*premium finish metal roof*fully landscaped yard with extensive stone work & circular drive. This home was designed, meticulously built for views from all rooms and has been lovingly cared for. Canyon Lake is between Austin/San Antonio and just down the road from New Braunfels where you can also enjoy Schlitterbahn, visit Historic Gruene, float the Comal/Guadalupe & much more. BEAUTIFUL Hillside home located in the peaceful & established neighborhood of Triple Peak Ranch Estates! This captivating property sits on over 1/2 an acre and boasts almost 6000 sqft. Enjoy panoramic views of Canyon Lake and the Texas Hill Country from almost every room. Notable features include 31′ vaulted tongue & groove pine ceilings* built-in custom cabinetry*majestic floor to ceiling rock fireplace*ss appliances/gas cooktop/double ovens*huge master retreat*3 dual element water heaters*4 split-system central heating/AC units*expansive decking w/hand-cut railing*commercial grade retaining wall*premium finish metal roof*fully landscaped yard with extensive stone work & circular drive. This home was designed, meticulously built for views from all rooms and has been lovingly cared for. Canyon Lake is between Austin/San Antonio and just down the road from New Braunfels where you can also enjoy Schlitterbahn, visit Historic Gruene, float the Comal/Guadalupe & much more. 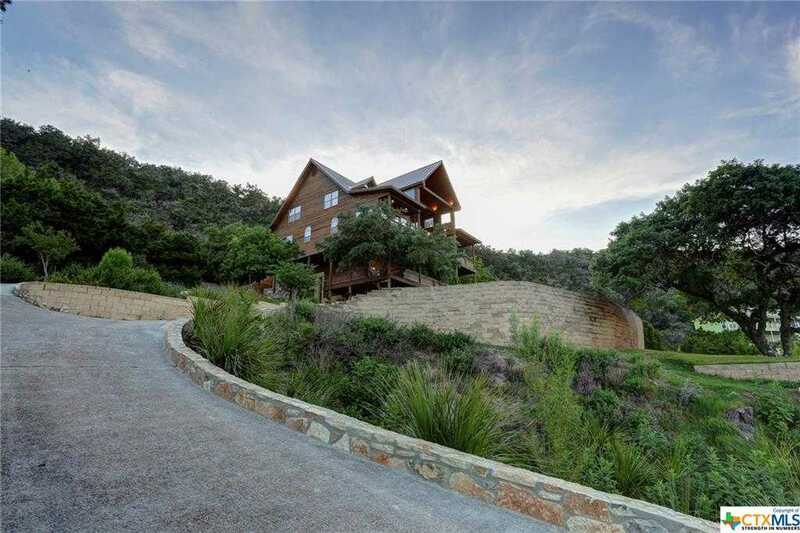 Please, send me more information on this property: MLS# 316389 – $599,900 – 1805 Triple Peak Dr, Canyon Lake, TX 78133. I would like to schedule a showing appointment for this property: MLS# 316389 – $599,900 – 1805 Triple Peak Dr, Canyon Lake, TX 78133.